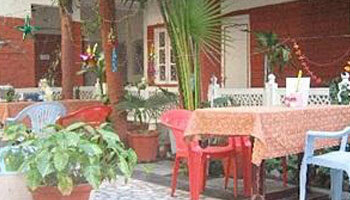 Tourist Rest House offers a quiet, comfortable and homely atmosphere. It is set in a quiet serene atmosphere. Tourist Rest House caters modern amenities and room service facility. All the rooms are facing a small garden. Where people sit and enjoy their meals in Candle Light. The hotel is 2.5 KM from railway station and bus stand is just 2 KM away. Nearest attractions are Taj Mahal and Red Fort. Travel Counter, Breakfast Services, Backup Generator, Airport Transportation, Currency Exchange, Parking, Doctor on Call, Laundry Facilities, Security Guard, Room Service. H/C Water, Cable/Satellite TV, Toothbrush/Razor on Request, House Keeping, DVD Player, Air Conditioning Room, Wakeup Calls, Attached Bathroom, Iron/Ironing Board.